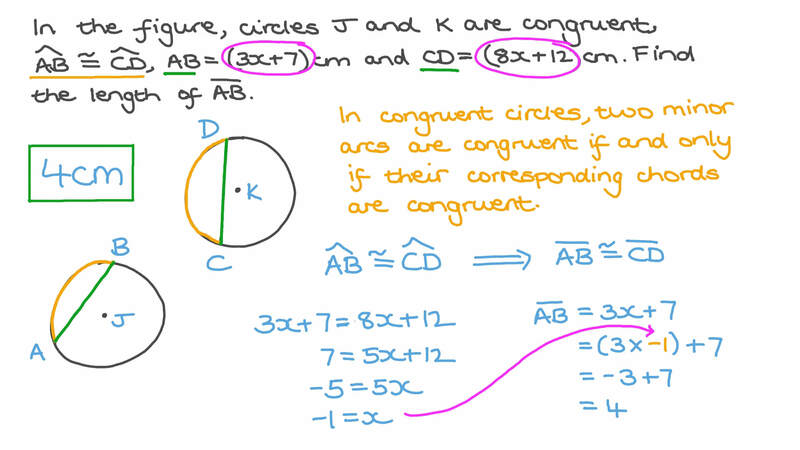 In this lesson, we will learn how to identify arcs, chords, and diameters and use the relations between them to solve problems. Which segment in this circle is a chord? In the figure, circles 𝐽 and 𝐾 are congruent, 𝐴 𝐵 ≅ 𝐶 𝐷 , 𝐴 𝐵 = ( 3 𝑥 + 7 ) c m , and 𝐶 𝐷 = ( 8 𝑥 + 1 2 ) c m . Find the length of 𝐴 𝐵 . Points 𝑋 and 𝑌 are midpoints of segments 𝐴 𝐵 and 𝐶 𝐷 respectively. If 𝐴 𝐵 = 6 0 , what is 𝐶 𝑌 ? The radius of the circle 𝑂 below is 87 cm, 𝐴 𝐵 ∥ 𝐶 𝐷 , and 𝑋 is the midpoint of 𝐴 𝐵 . Given that  𝑋 𝑂 intersects 𝐶 𝐷 at 𝑌 and 𝑂 𝑌 = 6 0 c m , find the length of 𝑌 𝐶 .
𝐴 𝐵 is a chord in circle 𝑀 whose radius is 25.5 cm. If 𝐴 𝐵 = 4 0 . 8 c m , what is the length of 𝐷 𝐸 ? Given 𝐴 𝑀 = 2 0 0 c m and 𝑀 𝐶 = 1 2 0 c m , find 𝐴 𝐵 . In circle 𝑀 , suppose 𝑀 𝐴 = 1 1 and 𝑀 𝐶 = 9 . 4 . Find the lengths of 𝐴 𝐵 and 𝐶 𝐷 to the nearest hundredth. In the given circle, 𝑂 𝐴 = 8 . 5 cm and 𝑂 𝐶 = 4 cm. Determine the lengths of 𝐴 𝐵 and 𝐶 𝐷 . In the following figure, determine all the chord(s) of the circle. The distance between the two lines and is 13 and . If the radius of the circle is 10.5, what is the length of ? If necessary, round your answer to 2 decimal places. Given that , and cm, determine the length of . Given that 𝐴 𝐵 = 𝐶 𝐷 , 𝐴 𝐵 = 1 5 c m , 𝑀 𝐹 = 4 𝑥 c m , and 𝐶 𝐷 = ( 1 1 𝑥 + 4 ) c m , determine the value of 𝑥 and the length of 𝐴 𝑀 . Given that 𝐴 𝐵 = 𝐶 𝐷 = ( 6 𝑥 + 3 ) c m , 𝑀 𝐸 = ( 3 𝑥 + 1 ) c m , and 𝑀 𝑂 = 4 c m , find the length of 𝐶 𝐷 . In the circle 𝑀 , if 𝐴 𝐵 = 1 8 . 4 c m , find the length of 𝐶 𝐵 . In circle 𝑆 , 𝑚 𝑃 𝑄 𝑅 = 6 2 ∘ . Find 𝑚 𝑃 𝑄 . If 𝑚 ∠ 𝐵 𝐴 𝐶 = 2 5 ∘ , what is 𝑚 ∠ 𝐹 𝐷 𝐸 ? The radius of circle 𝑀 is 60.9 cm, and 𝐴 𝐵 = 8 4 c m . What is the area of △ 𝐴 𝐷 𝐵 ? In the figure, the two circles are concentric at 𝑀 and 𝐴 𝐵 = 8 . Calculate the area of the shaded region, to the nearest hundredth. Two circles have been cut out of the bigger circle as seen in the picture. The point 𝑂 2 lies on both of the smaller circles and is the centre of the larger circle. Work out the remaining area. Give your answer accurate to two decimal places. Two small circles with the same diameter are drawn inside a larger circle as shown. Given that the diameter of the large circle is 9.8 mm, determine, to the nearest tenth, the area of the shaded part. The circumference of circle 𝑀 is 36.6 cm. Calculate 𝐵 𝐶 to the nearest tenth. In the figure, the smaller of the concentric circles is tangent to chord 𝐴 𝐵 at 𝐶 . If the large circle has radius 67 cm, and 𝐴 𝐵 = 1 2 0 c m , what is the radius of the smaller circle? If 𝑀 𝐹 > 𝑀 𝐸 , find the range of values of 𝑥 that satisfies the data represented. Point 𝑀 is at a distance 13 from 𝑂 , which is the centre of a circle of radius 7.3. Draw ray  𝑀 𝐵 to intersect the circle at 𝐴 and 𝐵 , with 𝐴 between 𝑀 and 𝐵 . If 𝑀 𝐴 = 5 . 7 what is 𝐴 𝐵 ? Given that the circle 𝑀 shown below has a radius of 25 cm, 𝐴 𝐵 = 3 6 c m , and 𝐶 𝐷 = 4 8 c m , find the length of 𝑀 𝑂 .